She is the older sister of Kami. She stands about 5' 6" and weighs a measly 100 lbs. She's a very bitter, angry person who is the leader of a 'kingdom' of the dead. She's bitter, as said before. She doesn't talk much but when she does they're usually harsh, hurtful words. Very skinny. Dark 'bags' under her eyes. Her fur isn't very soft, like Kami's, it's longer than hers though. Typically a green dress that's about mid-thigh in length. No shoes. 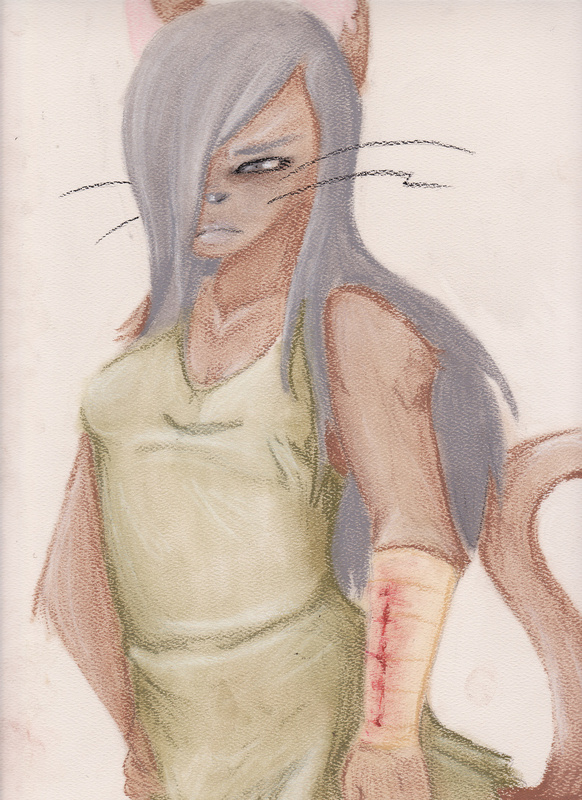 And a bandage on her left arm to cover a gaping hole in her arm. A picture of Hime done in chalk pastel. Not much to say other than I actually like the green dress on her. Decided to make this a character sheet for now until I draw something better.